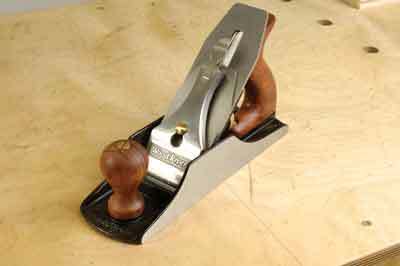 Having established back in F&C 209 that the Wood River shoulder plane - then only available from the US - represented extremely good value, the arrival of the V3 No.41/2 bench plane has been met with similar expectations. In the UK, Wood River planes are more familiarly represented under the Quangsheng brand and it just so happens that I have an early QS No.4 to make a good comparison. The new version has the same pared back aesthetic as the original with bubinga (Guibourtia demeusei) handles and stainless steel lever cap. It still sports the 3mm-thick blade and cap iron that come together firmly and after a few strokes on the Toishi-Ohishi waterstone, is ready to go. This plane was supplied by Peter Sefton with the back of the blade already flattened displaying a useful hollow. In essence, nothing much has changed in the performance of the plane and it's every bit as sweet as the Mk1 that's been in constant service ever since it arrived. As far as I can make out, the alterations are more cosmetic than anything else - perhaps a little more shape has been introduced to the lever cap plus the Wood River logo and rather more practical, the adjusting wheel has grown. Despite their performance, there still seems to be a little resistance to this quality import, but as they say, don't knock it until you've tried it. I've yet to hear a bad reaction from anyone who's actually used one.